27 Sep 2018 --- Failing to reach a Brexit deal could end up costing £9.3bn (US$12.2bn) a year as food retailers and their supply chain face a mass of additional tariffs as a result of the UK not negotiating a trading deal with the European Union. A new report from Barclays calculates widespread disruption and price hikes with the “Hard Brexit” model forecast to create an average tariff of 27 percent for food and drink supply chains which is significantly more than the 3-4 percent levy that would hit non-food products. According to the report – “Scale, Disruption and Brexit – a new dawn for UK food supply chains?” – grocery margins will typically be 3 percent to 5 percent and additional costs will likely end up being passed to consumers. On top of the 27 percent tariff calculation, every consignment of goods from the EU will require a customs declaration which starts at a minimum of £50 (US$61.85). Fully processed food and drink products, like orange juice, will attract the highest tariff rate of 31 percent compared to 29.5 percent for semi-processed products such as white sugar, and 9.7 percent for primary products and raw materials like bananas. There may also be “specific duties” on some products and these tariffs could be levied on a per unit basis; that is, by weight or volume. The Barclays report shows specific duties to disproportionately target certain products including meat, cereal, olive oil, wine, and sugar-based foods. By their nature, these tariffs place a higher burden on lower-value transactions, the report says. which attract both a category tariff and as a specific duty tariff. And the hardest hit products include those items which attract both a category tariff and as a specific duty tariff, such as frozen beef with a specific duty of 298 percent. 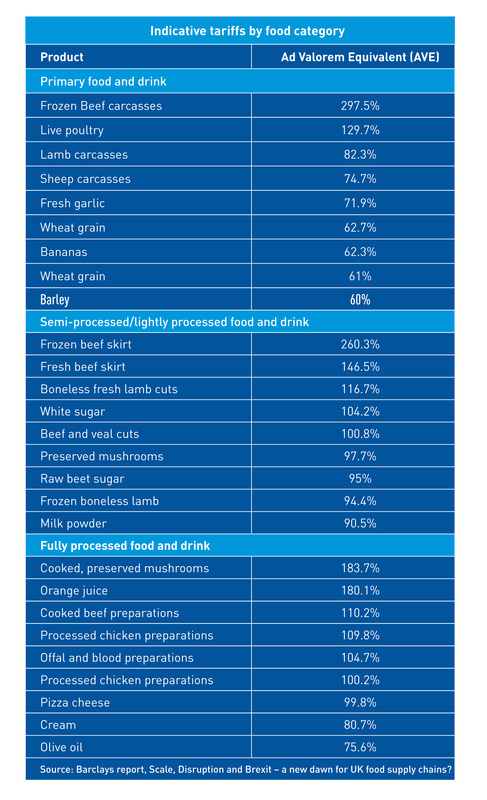 Common cooking products also face steep duties including beef cuts at 101 percent, cream at 81 percent and garlic at 71 percent (see table). Further costs could also mount under a hard Brexit. In addition to customs declarations, comes the burden of complying with stringent EU Sanitary and Phytosanitary (SPS) regulations, which could be the equivalent of paying an extra 8 percent in duty tax on EU food and drink imports. Brexit negotiations between UK Prime Minister Theresa May and President of the European Commission Jean-Claude Juncker have reached an impasse with no sign that a way forward can be paved. This is fueling concerns within the food industry, and elsewhere, that a no deal or “hard Brexit” is becoming more and more likely as the clock counts down to the March 29, 2019, deadline (a two-year transition period is also expected but this still remains unclear). In 2017, £48 billion (US$63 billion) worth of food and drink was imported into the UK from the EU which represents around 40 percent of the total UK market. Of these, 71 percent originating from within the EU entered the UK free of customs duties and other trade costs. Prime Minister May has put forward her Chequers deal as the “only viable option” but this has been completely rejected by EU counterparts and many MPs within the Conservative Party (mostly politicians who back Brexit) do not agree with the policies she is putting forward. Any deal agreed between the UK and EU would need to be backed by UK Parliament so it is important how much support May has from within her own Party. While a free trade deal or the Chequers option, would help the food industry avoid tariffs and related duties, a no-deal Brexit could mean significantly higher costs for retailers and consumers. The food and drink industry is one of Britain’s most important sectors, employing millions of people across the UK. 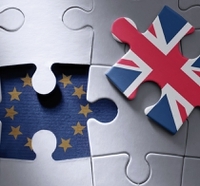 “For the good of both UK business and consumers, the potential impact on our producers and grocery retailers should be front and center of Brexit negotiations,” Gilmartin notes. Seventy-one percent of the UK’s imported food and drink comes from the EU while 60 percent of the country’s exports go to the EU. “A positive agreement on trade is essential if we are to protect UK exporters and avoid significant price rises for UK consumers,” he says. The food industry has been closely monitoring Brexit negotiations ever since the referendum in June 2016 with many representatives and organizations issuing repeated warnings that Government needs to seriously examine how best to trade with the EU, keeping in mind the impact on the food supply chain. The latest comes from the UK’s Food and Drink Federation in response to the latest batch of technical notices which were also unveiled by the UK government this week. Following on from an initial list of no-deal technical notices announced in August, the government has now set out more plans to be put into place in a situation the UK crashes out of the EU without a deal. This information demonstrates the potential impact a no deal scenario will have on areas of transport policy, including the haulage industry and those driving in and flying to and from Europe. One of the key areas of concern for the UK food and drink industry is the transportation of goods, border controls and how ports and airports will cope with movement after Brexit. Wright explains how UK food and drink manufacturers will need to make immediate and costly changes to product labeling to remove references to the EU in origin labeling. Additionally, a product labeled with a UK Food Business Operator’s name and address would no longer be able to be sold in EU markets, however, this would be mandatory for products sold in the UK. “The limited timeframe for such changes and the accompanying administrative burdens further threaten the success of UK export sales to the EU, our largest export market. If EU consumers are unable to access UK food and drink, the chances are they will switch to other sources of supply and those export markets will be lost forever,” Wright continues. Consignments heading to the continent will require physical and documentation inspections as they enter the EU and within hours this will result in turmoil at Calais, which currently does not have a border inspection post. Any transport backlog and delays will result in food imports from the EU facing severe disruption, with ferries, lorries, and trains unavailable to transport food to the UK side of the channel, he says. Food retailers and suppliers are anxious to see whether a Brexit deal can be reached that keeps costs down for the sector. For example, a full customs union would maintain the current tariff-free trade enjoyed by the UK and the EU but would limit the UK’s ability to trade unilaterally with other countries. A free trade agreement (FTA) would be likely to minimize the amount and cost of new tariffs imposed on trade. Though an FTA would still require extra fees from logistics, such as customs declarations, it would also free the UK to make other trade deals. UK politicians have very limited time left to negotiate a withdrawal agreement and some believe that the consequences of a pending Brexit where thus far no deal has been determined, is already having an impact. These include the possibility of businesses and consumers stockpiling certain goods, relocating production operations to the EU in a bid to avoid problems and hedging currency risks, to name a few. One of the principal fears is that prices will likely increase and markets will become distorted.